Those of you have read a couple of my posts will know that I don't really like buffets. I find them extensive and never really representative of what the restaurant has to offer. There have been very few in Bangalore who have managed to make their buffet count for them - recently it was the Village (for the experience), the Dancing Wok (limited and great) and the West View Grill House (the array and the style). So when we were invited to a Kashmiri Pandit spread at the ITC Gardenia, we went there with all the expectations of something brilliant. Ok, so heads up - the Kashmiri Pandit spread is part of the dinner buffet on offer at the Cubbon Pavilion - so take a walk around the table first and decide what you want on your plate. There is a quite a bit and unfortunately that tummy-on-hire concept is yet to take off. We had a wonderful chat with Chef Suman Kaul under whose watchful eyes these dishes have been allowed to the table. Kashmiri Pandit cuisine is not all about sweet rice topped off with raisins (contrary to what we are generally served in the name of Kashmir). Saffron is of course predominant. Onions and garlic are not much used, and dried ginger is where all the heat comes from. Meat is treated with love and often slow cooked overnight. For the Pandits it is mutton that reigns supreme. This conversation took place over the starters which was Kahwa - a sweet hot tea with crushed dried fruits at the bottom of the cup that came floating to the top when the tea was poured in. 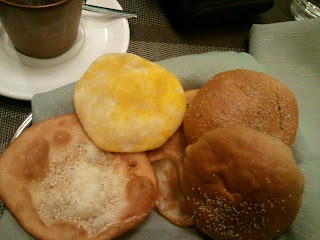 Also a bread basket - sheermal, made with saffron and milk, and kulcha, pur and telvour. 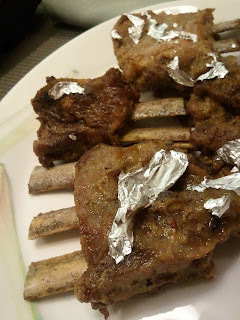 These were paired with Kabargah, mutton that has been simmered with milk, saffron, a blend of Kashmiri spices and topped of with varq. The breads were great on their own, seeing that junior demolished a basket on her own. What made them even better was the Kabargah. All it needed was a gentle slicing with a butter knife and off it slipped from the bones, onto the bread and into our mouths. 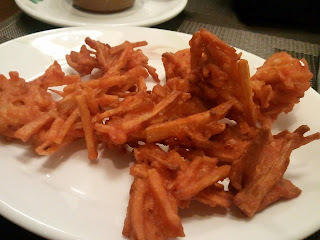 There was also Lotus stem fries - first time having these and was taken aback by the fibery texture at first bite, but then they turned out to be one of those snacks that grows on to you and you can't stop eating. We took a walk around the buffet and decided how we wanted to go about. The thing about Kashmiri cuisine is that all the gravies have to eaten with steamed rice. So we started with Kanagache Doone Var - this is is rice preparation, quite close to the khichdi we make, but a richer version. It had morels and whole walnuts in it which made it a dish that was hot, soft and crunchy and very very comforting to have. The best way to eat it is with a generous sprinkling of the dried fruits that is kept along side it at the counter. There were three meat dishes - I took each in the little bowls placed around and asked for one bigger bowl of rice on the side. Again, both of us served ourselves just one piece of meat each to make sure we could head to the vegetarian section as well. The first was a chicken dish - which was on the spicier side but with a thin gravy that packed all the flavor. One spoonful with the rice and you will have all your taste buds dancing. The second was a fish dish - Gaad Monje, which was cooked with knolkhol. Again - though the gravies looked similar, there was a sea change in flavors. The fillet of fish was thick and with rice as an accompaniment, made for quite the mouthful. This was not spicy in the least. Next we decided to give the white rice a break and headed for the kheema pulao. This was again not too heavy and with a bit of raita on the side made for a nice in-between bite. The kheema is so well ground that it blends with the rice perfectly. Took a small break after this running behind junior who had found some friends for herself. But when we were done, it was straight to the table and to the Mutton RoganJosh that was just calling out to us. The meat on the RoganJosh was typically the fall-of-the-bone kinds and the gravy has to be tasted to understand what I mean by fabulous. It will also spoil you for life when it comes to a good Roganjosh. It was back to rice again and this time we clubbed it with two vegetarian dishes - the Haak, which is a gravy of collard greens and the Nadur Yakhni which is a gravy of Lotus stems. The Haak is literally the greens cooked in their own juices and helped along with some chillies. My mother will be so proud to see me of all people down an entire bowl without complaints. The Lotus stem dish was the second version of this ingredient for the night. It will take some skillful wrestling to break a piece but with the yogurt based gravy that it comes it, will make it worth the effort. There were two other vegetarian gravies - the Mauje Chamman Kaliya - Paneer with Knolkhol and the Gogje Razma which is Rajma with turnips. But our tummies were sending out distress signals and we just had to save space for desserts. 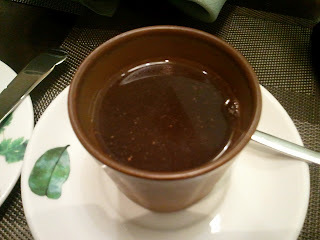 This Kashmiri Pandit special is part of the ongoing dinner buffet. So besides the dishes mentioned here, there is huge selection of dishes to choose from as well. But if a taste of Kashmir is what you are after, you will choose wisely. All of the food - meats and veggies have ghee as their primary medium of cooking, so if you are on a diet of any sort, this can only fall in your permissible night(s) of indulgence. Its ITC, so I don't have to tell you about the level of service - its great. The Kashmiri Pandit festival is on from March 2nd to March 11th at the Cubbon Pavilion. This is for dinner only. The buffet is priced at Rs 1250++ per guest. And if you prefer unlimited beer and beverages it is Rs 1500++ per guest.